This easy-to-make tortilla lasagna will be a hit with your guests. It's easy to make, extremely tasty, and looks like it took a lot more effort than it actually did. Serve with Margaritas, Mexican beer, or dry white wine. With a little butter or olive oil, cook the meat, onions, and spices together until the meat is cooked through. Add all the other ingredients and stir until well mixed. Use butter or oil to coat a casserole dish and then put down a layer of tortillas. Spoon in half of your meat sauce, and sprinkle with 1/3 of the cheese. 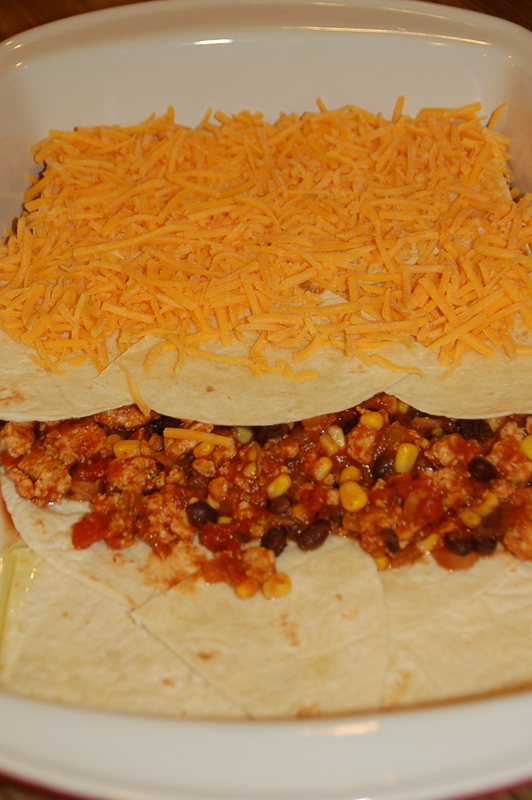 Please another layer or the meat mixture and repeat the cheese and tortilla steps. Cover the top of the lasagna with the remaining cheese and the chives. Bake at 425 for 15 minutes. Place under the broiler for 3-5 minutes to brown the cheese.